While looking over Amber's progress for this semester, I came to the realization that her third quarter of tenth grade was complete. It's astonishing to think how quickly time is passing. Although she has completed three of the five months in our official second semester, I'm still calling this the end of third quarter. 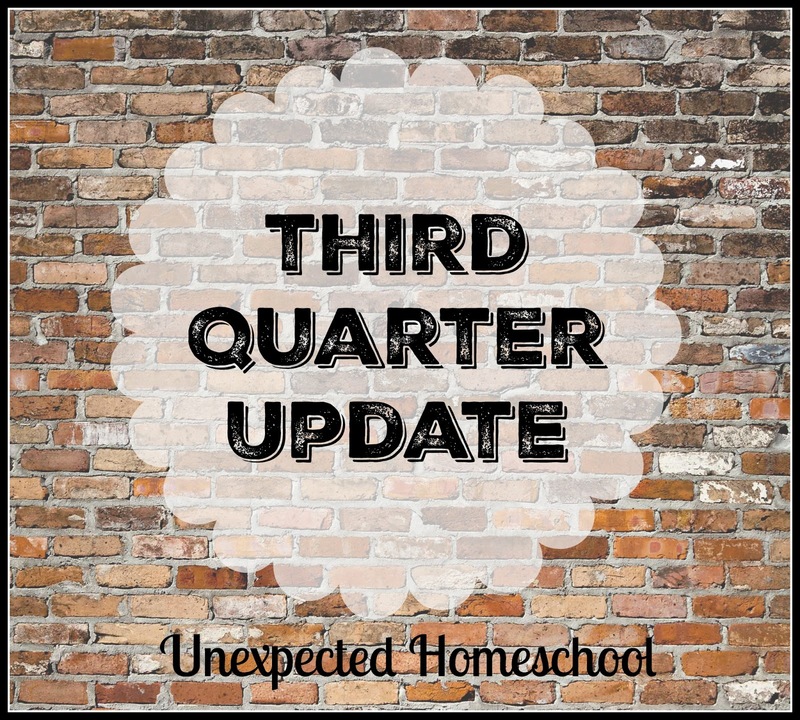 Technically, in Missouri we record hours through June on the current school year, and since Amber will be schooling over the summer that makes April first the mid-point of second semester. We are not at all concerned about making her hours required by the state of Missouri. She's in excellent shape at this point. This feels a little harder to analyze. Amber has quite a few partially finished credits that we've been spreading over a couple of years. If we total everything, she is right on track - ahead even. Still, writing it out, looks a bit odd sometimes. U.S. History - Half finished? Roughly? We took breaks for other history subjects. Eventually she will have 1 credit from it. We plan to finish in 11th grade. Ancient History - Half finished. She will finish it second semester of 11th grade. 1 credit, eventually. Creative Writing: Almost 1 credit. She's hoping to finish it up over the summer. German - 1+ credit so far. She began in middle school with German, and I haven't quite decided how much of that to credit. So for now, we are calling it 1+ credits. Greek - Almost 1 credit. Since we started at an odd time last school year, she only now has completed a full year. Latin - 1/4 credit. She did take several years of it in late elementary and middle school, and earned a little bit doing a refresh. She is still deciding if she wants to take Latin next year with the German and Greek, or include Hebrew instead. Art - co-op art class has not completed yet, and she has 1/2 credit to date already. Music - ongoing flute lessons and performances. 1/4 credit already this school year. Does not include anything from last school year, or what will still be earned this year. Drama - co-op drama class has not completed yet or had their performance. Already 1/3 credit. 9th grade looked similar in the fine arts, and we have no reason to believe 11th and 12th will look much different. She's going to have a good many fine arts elective credits. Driver's Ed - A little dribble of time. We're not terribly concerned by this subject either. Amber has her whole credit earned already and it looks like she will be taking a home economics class at co-op next year. So, all is well. Overall she is right on track and even ahead on her credits. She will be finishing her last half credit of science over the summer and then have more time for her language electives. Math is the one place she struggles. We have some ideas to implement and she is going to need to review some math concepts prior to taking the ACT in the fall. She'll survive math and live to curse it in multiple languages.